It is no secret that Speaker John Boehner has little, if any, support in the Tea Party faction of the party. Many have wondered if he will be able to keep the position if the Republicans manage to retain a majority in the House. Fortunately, I have found the perfect replacement. This man embodies all of the characteristics that have made Eric Cantor and Mitch McConnell the darlings of the Far Right. "On Friday evening, Schettino had rung his former boss, Mario Polombo, whom he admired, and had told him he planned to dedicate the next maneuver to him -- he would sail the ship as close to the island as possible during the approach to the port of Giglio, continuing what appears to have been a traditional spectacle to greet the islanders. Polombo had told him he wasn't on the island to see it. Then, according to newspaper La Stampa, Schettino had asked him how deep the water was -- shortly after that, the ship rammed the granite rock. Since then, all Schettino's explanation seem unbelievable. First he claimed the offending rock was not recorded on any maritime chart. Then he told investigators and journalists that he had been the last to leave the ship. Now he says he accidentally fell into a lifeboat." 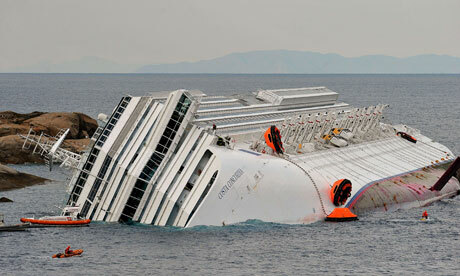 The report made by the investigating judge said that after Schettino left the ship he made "no serious attempt" to return "even to the vicinity" of the Costa Concordia. He "watched the ship sink," she said.